Octavian had been involved in conflicts with Marc Antony and Marcus Aemilius Lepidus, but in October of 43 BC, they decided to meet to unify their power. Officially ending the Roman Republican period, they met near modern-day Bologna on November 11, 43 BC, to draft the Lex Titia, creating the legally established Second Triumvirate when signed into law two weeks later. The term was for five years, at which time it would be reviewed and renewed. The Triumvirate, which held supreme authority, was officially titled Triumviri Rei Publicae Constituendae Consulari Potestate, translating to “Three Men for Confirming the Republic with Consular Power”. 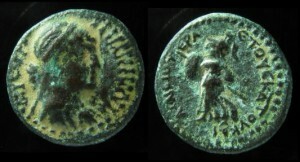 The titles are shown on coins as III VIR R P C and the name of the triumvir. After the triumvirs sorted thing out, Lepidus transferred control of seven of his legions to Octavian and Antony to use in the continuing war against Brutus and Cassius, who still controlled the eastern Roman territories. Octavian was also given rule over Sicily and Sardinia, but he first had to take them from Sextus Pompey, the leader of the Pompeian faction of the First Triumvirate, Pompey the Great. The new leaders were in need of a lot of money for their quest to consolidate Rome into one unified people, so they turned to proscriptions. This practice had two benefits – eliminating opponents, while refilling the treasury. The declaration against the Cicero family, strong opponent of both Antony and previously Julius Caesar was expected. Ancient sources speak of surprise when added to the enemies of the state was Lepidus’s own brother, Lucius Aemilius Lepidus Paullus. 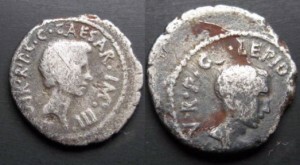 He, along with Julius Caesar’s legate, Lucius Julius Caesar, were targeted because they opposed the initial alliance of Antony and Lepidus, but both ended up surviving. While the triumvirs were working on building their finances and support, they were also planning their first strategic maneuvers. In October, 42 BC, Antony and Octavian engaged Brutus and Cassius in two battles outside of Macedonia-Philippi. Octavian took on Brutus and Antony faced Cassius. Initially, Brutus was besting Octavian, going so far as to invading his camp, while Antony defeated Cassius, who committed suicide after falsely being told Brutus was losing as well. Brutus retreated with his troops, as well as the remainder of Cassius’s forces, but was routed on October 23 in a second battle in the area and also committed suicide. The territory redistribution consisted of Octavian taking farms and giving them to soldiers. 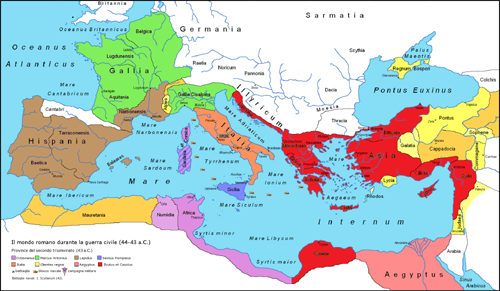 This led to the Perusine War, led by Marc Antony’s brother, Lucius Antonius, supported by Antony’s wife Fulvia. Octavian asked Lepidus to guard Rome while he gathered forces to deal with the insurrection, but Antonius attacked Rome and defeated Lepidus, who was forced to flee to Octavian. Octavian finished gathering his army and marched back on Rome, causing Antonius to flee to Perugia and surrendering during the winter of 41-40 BC. Octavian returned to Rome, now the sole ruler of Italy, and Lepidus was confirmed as governor of Africa and given Antony’s six legions there. The triumvirs agreed to meet in September, 40 BC, and signed the Treaty of Brundisium, making the new divisions of the territories official. Around this time, Fulvia died and Antony married Octavian’s sister, Octavia, to solidify their agreement. The only major opposition that remained from within the territories was Sextus Pompey. Pompey still controlled Sicily, Corsica and Sardinia and used his naval forces to raid the Roman shipping grain supply, along with raiding Italian towns. Octavian and Antony negotiated with Pompey to stop pirating in 39 BC, but conflicts continued regardless. In 38 BC, Octavian tried to invade Sicily, but was repelled. Meanwhile, Antony was trying to take over Parthia and needed more troops. In exchange for more ground forces from Octavian, Antony delivered ships for another attack and Lepidus helped from Africa, and the Lex Titia was renewed for another five years. Octavian’s new campaign against Sicily was led by his good friend and lieutenant, Marcus Agrippa, and was finally successful in 36 BC. However, the first to land troops in the campaign was Lepidus, who had raised a formidable 14-legion army and considerable navy. Lepidus was feeling slighted by Octavian and Antony and stationed his troops in Sicily, insisting his triumvir territories be reinstated to what they were when the Lex Titia was signed. Octavian accused Lepidus of trying to foment rebellion and had him stripped of his titles, except Pontifex Maximus, and exiled to Circeii. At the same time, Agrippa was chasing down Sextus Pompey, destroying his navy along the way, and eventually cornering him in Asia Minor-Miletus in 35 BC. Antony’s commander, Marcus Titius, executed Pompey without a trial, which was illegal, but had the effect of leaving just two people vying for ultimate power – Octavian and Marc Antony. Antony was still off fighting against the Partians, while Octavian turned his attention to Illyricum. The Parthians were successful in repelling Antony’s forces, who decided to attack Armenia instead, with the help of Cleopatra VII of Egypt. Antony, despite still being married to Octavia, spent his free time in Egypt in the company of Cleopatra. After taking over Armenia, Antony read out the Donations of Alexandria, granting the territory to Cleopatra’s children, whom he fathered. When the Lex Titia expired in 33 BC, Octavian didn’t sign to renew it. Antony, however, kept using the title triumvir anyway. Octavian managed to get a copy of Antony’s will the next year and exposed it to the Roman people, showing Antony was loyal to Cleopatra and her children and the Senate declared war on Cleopatra. Octavian engaged Antony and Cleopatra’s naval forces at the Battle of Actium in 31 BC, defeating them soundly and pursuing them into Africa. The couple committed suicide in 30 BC, rather than being paraded through Rome. Over the next three years, Octavian would oversee the transition from the vestiges of the Republican and Imperatorial periods to the beginning of the Roman Empire in 27 BC, culminating with changing his name to Augustus and becoming the first emperor. Lepidus and Octavian. 42 BC. AR Denarius (3.64 gm).VERY RARE AND VERY INTERESTING HISTORICAL COIN ! !